Bluegrass Horse Feeds customer Jessica McIntyre gives us an insight into her “Behind the Success”. You might remember Jessica from the Geoff Billington Masterclass as one of the demo riders. 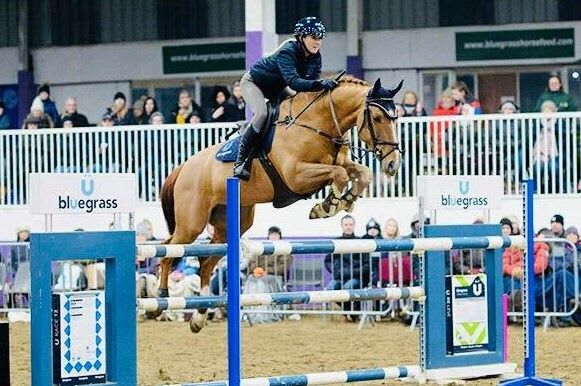 Jessica started riding at the age of three, and with both parents having evented up to international level she always had success in her sight. She has competed in three international events including her highlight of 2018, finishing 2nd at Millstreet International Horse Trials. Since transitioning to Show jumping in September she is looking forward to an exciting season ahead. 5)Do you prefer the Greatest Showman or Les Mis soundtrack? 6)What’s the one thing in your tack room you can’t be without? V.I.P gel pad - I use it on every horse. 7)Have you any routines or habits before you go in the ring? It would have to be Race 13 as it has given one of my lower energy horses a new lease of life! 11) What’s your favourite Bluegrass Horse Feed Product?